The launch of Big Lottery’s People Powered Change, which I wrote about earlier and have just attended, generated the usual mixed reaction online and in the room from romantics, boosters and critics. On the romantics and boosters side we had huge enthusiasm for a BIG vision of bottom up community action catalysed by £5.76 million of funding, including £2.2 million support for 25 social entrepreneurs though Unltd, £830,000 for the Your Square Mile online system for local communities, and £820,000 for the Young Foundation. NESTA Neighbourhood Challenge gets £2 million. Links below to details. From the critics we had “nothing new here, people have been doing it for years”, ” real community activists won’t use the technology” and “it’s too top-down, with too little grass-roots experience”, plus “give money to local projects not national programmes”. Over the past week the partners in Big Lottery Fund’s People Powered Change initiative have provided some updating posts about their work, on BIG’s blog. This was promised as part of the evolution of PPC, which I wrote about earlier, referring there to the work I and colleagues did on the process. It was part of BIG’s exploration of how to be more than a funder, and as Linda Quinn, Director of Communications an Marketing puts it BIG is: “… developing a number of ideas which we hope will make us a more engaged, open and social organisation. I also hope it will help us support projects to share their stories, inspirations and ideas”. Providing support for projects to tell, share and learn from stories including surgeries and games. 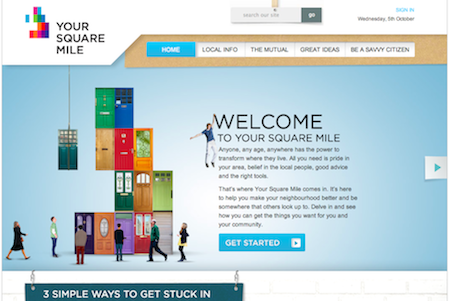 The posts on the BIG blog are from Your Square Mile, Media Trust, UnLtd, NESTA and the Young Foundation. They mainly focus on the work they are supporting on the ground, as a result of BIG funding. It is all fascinating stuff, and I hope we’ll see more, whether on the BIG blog or on their own sites. 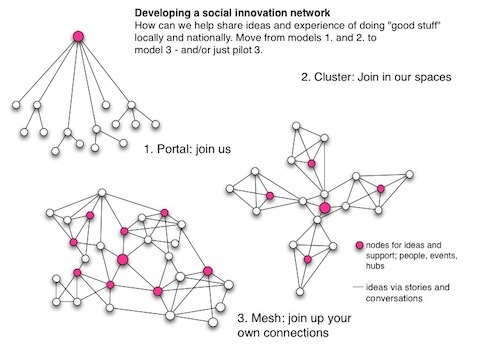 In my mind it sparks the possibility that BIG could extend its own “sociable organisation” approach to helping create a more sociable network for People Powered Change. 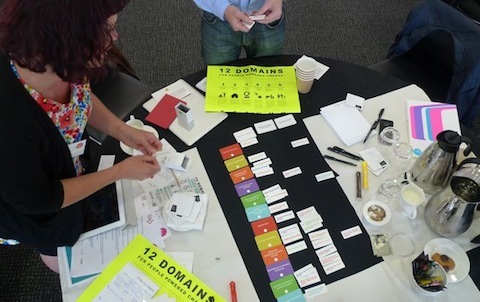 As part of our work with BIG, Drew Mackie did some quick network mapping at the workshop that we ran. 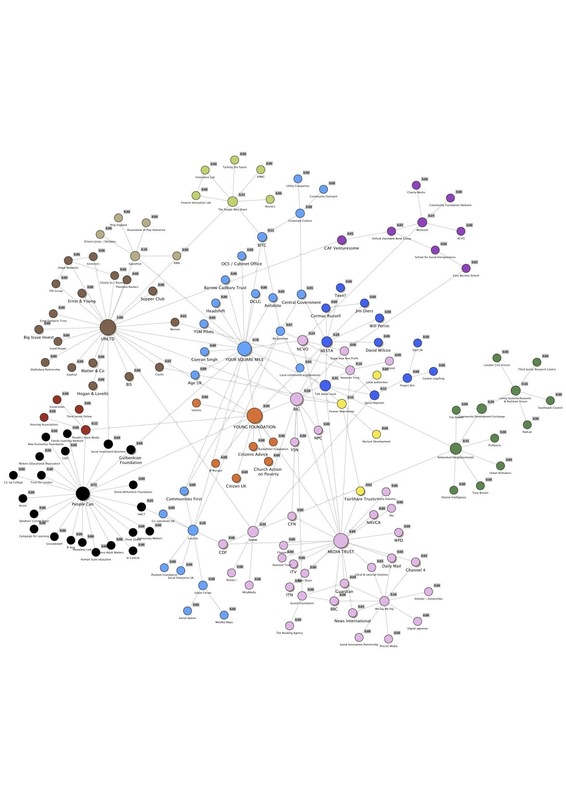 You can see one of the resulting maps above, showing who knew who and who worked with whom. 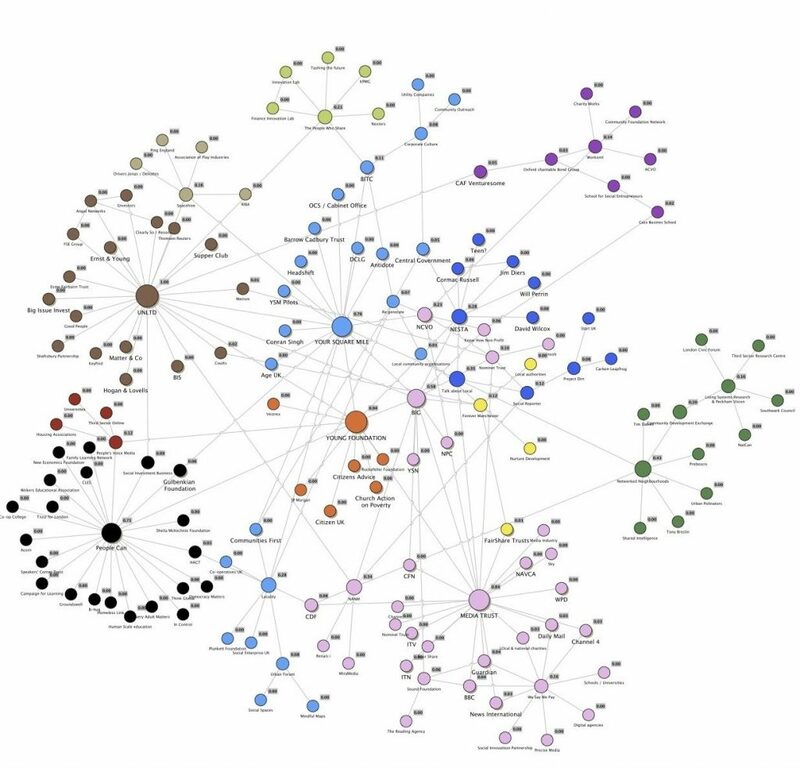 Drew also asked what resources organisations held, and you can see those in this online map, by mousing over the nodes. The map is just a snapshot of relationships and resources at any time, and doesn’t say anything much about the strength of relationships or collaborations that may, or not not, be evolving. BIG is a strong supporter of the idea of Asset Based Community Development in localities, though which the aim is to nurture and build on resources, rather than just identifying problems and seeking more funds. Or if you are seeking more funds, showing that you are making the most of what you have. ways to promote better internal communications …. … and hey, I find I’m repeating many of the ideas that Linda and colleagues are already exploring for BIG. How much more powerful it would be if BIG could become not just a more social organisation, or even a networked organisation, but one that is catalysing a really active network for People Powered Change. We looked at different network models as part of our work with BIG, using the diagram of this general example representing a shift from a hierarchy through more of cluster towards a mesh. As Tom Phillips mentioned at the time, the nodes can be created by sociable events … so that part of BIG’s programme will certainly be helpful. If the network developed, it could be the strategic movement that would support the one-the-ground developments reported by PPC partners – not just through their individual organisational efforts, but by drawing on the strengths of the network as a whole. It may well be that some of this is happening already, and if so early examples would be great topics for further posts from BIG and partners, or others in the field. One great example is the work of the NESTA Neighbourhood Challenge programme, which funded 17 local projects under PPC … reported here by Alice Casey. Each neighbourhood was asked to blog about their work as it developed, and so maybe there’s potential for a PPC network in miniature emerging already. I hear that this has further upset some people in the field who have been developing community reporting for a few years. There’s a feeling the Trust is failing to acknowledge or work with these other potential partners, so the Civil Society news headline “Media Trust collaborates to deliver citizen journalism project” rankles just a bit. Community and social reporter types may be keeping their heads down (if they’ve heard the news) because Media Trust could be a client/news distributor, and anyway who wants to upset Big Lottery Fund (BIG). However, comments are taking off under the story, with a strong challenge from Gary Copitch of People’s Voice Media, who have been running community reporter programmes for over three years. He says: “I am afraid to say this is just another example of an organisation who receives Lottery funding only to duplicate existing provision”. Community media veteran Steve Thompson has been working in this field since 1997: “Folks should always be cautious about claiming “firsts” as there is nothing new under the sun”. I can add an archive of material and activities going to to the mid 1990s, when a group of us set up UK Communities Online. I find it particularly difficult to write about this, because like others in the field would love to work on Newsnet. I know and respect the people involved, and recent had a very cordial interview with Adam Perry, and earlier with the Trust’s director of marketing and communication services Gavin Sheppard. In addition, I’ve spent the last few months working with BIG on how they might develop People Powered Change. John Popham and I did that by a process of open exploration on socialreporters.net, summarised here, and leading up to a very creative workshop. BIG are now reflecting on future plans, with decisions at committee next March. The focus of the work ended up around how BIG can be more than a funder, perhaps operating in addition as a broker and convenor to help nurture the development of existing activities as well as funding new ones. At local level BIG supports the idea of Asset Based Community Development, as I reported here. With hindsight, it might have been better if this approach had extended to the big investments made under the people Powered Change banner. I reflected on the launch here: People Powered Change needs ppchange communications. It’s always tempting to over-flatter a client, but I must say how impressed I’ve been with the way that BIG staff have given John and I a free hand in reporting, and have now started some significant internal discussions triggered by the conversations that started. There’s particular problem for a funder in opening up and taking on additional roles, because there’s usually “give us the money” in the background. So: how to report on this story, in a way that helps move things forward positively? What’s the storylines … beyond the easy controversy angle? Is the criticism just sour grapes from some community media types jealous of new people in the field? The Media Trust does have the skills and resources to do things at scale. But shouldn’t they build in the skills of those with grassroots experience? Is there a danger that the focus on “news” in Newsnet will miss the opportunity to bring to the surface deeper insights about the ways that people are taking action locally – the sort of thing revealed by the recent micro-mapping research? Is BIG investment of public money (that is, our lottery punts) in Newsnet leading to some unfair competition with organisations like People’s Voice Media? I would be interested to hear also from Talk About Local, who do excellent work in the field as well. Should BIG give some sort of steer to their People Powered Change beneficiaries – who are listed as partners, and not just grantees? And have I just wrecked my chances of further work with BIG, and any relationship with Media Trust? Maybe – but I don’t think you can call yourself a reporter if those jobs that verge on consultancy prevent you writing about significant issues. I think that the solution is fairly simple … if BIG will forgive a little cheekiness on the last day of my contract. How about convening an open event in the New Year around the role of community and social reporting in People Powered Change, inviting Media Trust and other interests along … and running that as a consensus-building workshop. The one big problem I found at the start of the work on People Powered Change is that people didn’t talk to each other enough because they were busy delivering (although I think that’s now changing). What better topic to start a new round of open conversations than with community reporting? We can’t aim to help people in local communities find their own voice, if we can’t do that among the various interests involved. Meanwhile, comments are very welcome here, or if you spot that discussion is happening elsewhere tweet @Media_Trust @davidwilcox. The #newsnet tag seems to be mainly German rather than UK discussion. There is also a #ppchange tag. Previously: Caroline Diehl, chief executive of Media Trust, responded to my earlier story in a comment here, explaining how they will collaborate locally and inviting people to express an interest. Update: the Media Trust is offering to answer questions in a video interview. Add yours here. I’m spending today at an excellent Developing Solutions Camp organised by Kent Connect on using technology for local communities, as you can see here. While developers worked up presentations of their prototypes, and got ready to pitch for prizes, I talked to Tom Phillips, who until recently worked in local government, about the work I’m doing with Big Lottery Fund (BIG) on People Powered Change. Part of that work is to explore how BIG can be more than a funder, and help groups that they fund to they share ideas and experience. As part of the discussion, I offered a diagram suggesting a change from hierarchical structures to more of a peer-to-peer mesh: Moving from join us, join in, to join up yourselves. I first posted this on socialreporters.net, where John popham and I are blogging for Big Lottery Fund about development of People Powered Change. There’s a lot of links to earlier posts on this site about knowledge sharing and the Social App Store idea. Local democracy is a competitive business: how can Create a Council be more engaging? Last night’s event on why Londoners might wish to campaign for the equivalent of local parish councils brought home to me the gap between new and older forms of engagement and representation – and prompted some ideas on how to blend the two. I’ve followed up my earlier post about the event with one over at socialreporters.net, where John Popham and I are blogging for the Big Lottery Fund People Powered Change programme. I’ve copied that below to save you some clicks. As you’ll see there was a strong case, in principle, for new local councils as a way in which local people could have more control over their area, raise funds through a precept, and decide how to spend it. I found the people from the National Association for Local Councils (NALC) – who represent 9000 parish and town councils – very knowledgable and engaging. They had invited along some passionate enthusiasts for local councils to talk to us at the Coin Street Community Centre, were generous with the wine and nibbles, and well equipped with leaflets.. The biggest and most thoughtful bottom-up support for the idea, and a big contribution to its practice, has come from the Transition Network, where Charlotte Du Cann and Ed Mitchell are editing and producing a social reporting project. Twelve writers around the country are compiling a national blog about their real life experiences of being in Transition … moving towards low carbon, lower energy lifestyles and communities. I reported recently from the Transition Network conference. The Big Lottery Fund is the largest single funder of the community and voluntary sector (more than £1.6 billion since 2004), providing over 9000 small grants last year through Awards for All alone. As it says in its strategic framework, it is also committed to being an intelligent funder not just a distributor of cash. It is therefore significant that BIG is putting a lot of emphasis through its People Powered Change programme on what’s known as Asset Based Community Development. Put simply, this means looking for the skills, wisdom, creativity and enthusiasm of people in local communities rather than just starting with the problems, packaging up projects to meet the needs, and saying “give us the money”. If Government were promoting the approach you might be suspicious that it’s all part of deficit-reduction and cuts … but coming from BIG it is perhaps more credible, not least since they have a lot of successfully-funded projects to point to. In hard times we do have to do more with what we have – but that can be a good thing anyway. Yesterday BIG hosted an event in London where we heard from international proponents of ABCD – Jim Diers and Cormac Russell – and also from Anne-Marie Yiannis of Peckham Settlement. Jim writes here on the ppchange site, and Cormac has produced an excellent guide (download pdf) to the 12 domains of activity where people can change their lives and bring about solutions to their problems. After the event I talked to Jim and Cormac – asking Jim how things had changed since we last met up just before the launch of the Big Society manifesto. You can see that 2010 interview here. Earlier in the event I interviewed Cormac while we were playing a game – actually a serious exercise devised by Tessy Britton and Cormac. Over the past few months Tessy has taken the idea of ABCD on the road through Travelling pantry workshops, and made the ideas engaging and understandable through the stories in Hand Made Books. Do take a look here. For yesterday’s exercise we cleared away the coffee cups on our tables and opened up some beautifully designed packs of cards that enabled us to lay out the 12 domains (like health and wellbeing, safety and security, the environment) down one side, and then across the top choices about things only we could do on our own, things only government could do, and things that needed citizen-government collaboration. We then had to sort lots of possible activities onto the grid. The government-only areas were far more sparcely-filled. You can read more about Cormac and Jim’s organisation Nurture Development UK here, and also join a European online community about ABCD here. I believe that the cards exercise will be available for DIY use, and I’ll see if I can find out more about that and report back. I like the way that the exercise puts a framework for thinking about strengths-based community development on the table and provides some conversation starters. You can see from blog posts here that Tessy’s repertoire of workshop props extends to Lego and beyond, so that talking moves toward creating together. One thought that occurred to me yesterday: the next creative step for Big Lottery might be to think about ABCD at national level. We have an enormous wealth of creative talent among different organisations and individuals working with communities, but often we end up being protective of our skills and ideas in order to pitch yet another funding bid or tender at funding agencies. Groups outside London can feel disadvantaged in this process, and it is enormously frustrating and wasteful. BIG is unusually well-placed to act as convenor and encourager of a more open approach – helping us figure out where we have to compete, where we might collaborate with each others, and how we might work more productively with agencies. That would be a good game. The Big Lottery grant of £1.89 million to enable the Media Trust to develop a network of news hubs, supporting citizen journalism throughout the UK, caused a stir recently because it was awarded without competition, organisations with a track record outside London felt excluded … and in the age of localism should we have central systems or something more bespoke? Read the backstory here, the original announcement, and the latest response from BIG’s CEO Peter Wanless. Fortunately a more positive story emerged when I was able to talk to Media Trust CEO Caroline Diehl, chairing sessions at the Third Sector Social Media Conference, and the Trust’s director of marketing and communication services Gavin Sheppard.